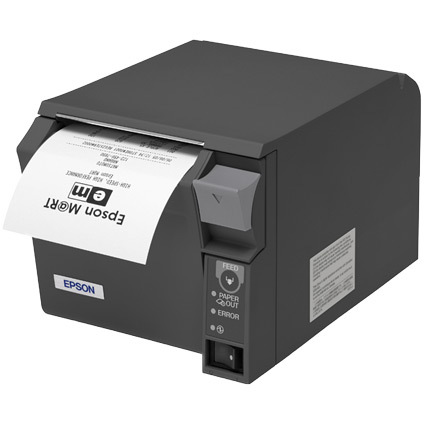 The Epson TM-T70II receipt printer improves on the TM-T70 line, adding enhanced performance and durability over the older model. The unique front-feed printer provides space saving and greater spill management, fantastic for restaurants, garden centers, or businesses that might not have much counter space. At 4.49" tall, the TM-T70II is shorter than most printers on the market. Front-feeding allows the printer to be stored under a counter if needed, increasing counter space for other items. 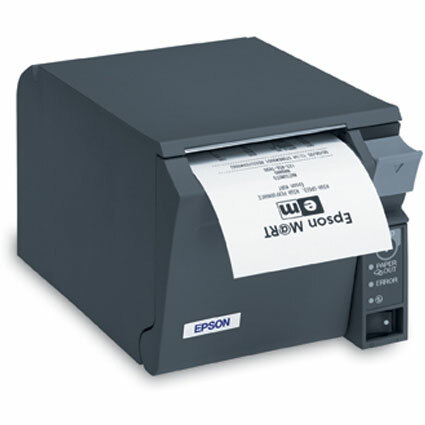 Epson designed the printer to be spill resistant, improving performance and extending the life span in garden centers, bars, or businesses that may deal with liquids at the checkstand. Direct thermal printing is easy with the TM-T70II. At nearly ten inches per second, the print speed of the TM-T70II will minimize wait times at checkout or ordering. This speed bump- almost 50% faster than the original TM-T70- allows for success in high stakes environments, such as grocery or high-volume fast food operations. Longevity is vital for receipt printers and the TM-T70II is no exception. Using Epson´s great hardware, the printhead is rated for 65 million lines printed, and the auto cutter provides up to 1.7 million cuts. A two year warranty comes standard, with additional service plans available, giving you greater peace of mind for your investment.